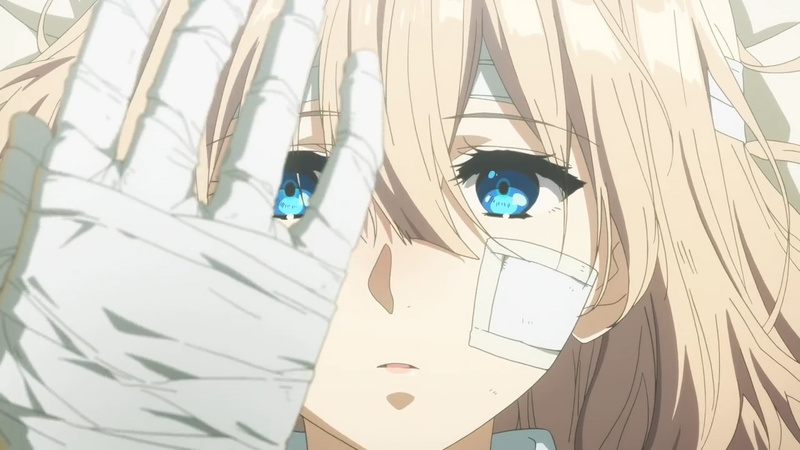 Let me start by saying that, despite how this will undoubtedly be framed amongst certain crews that aren’t fond of the studio, Violet Evergarden is in a way the safest project Kyoto Animation has had in a while. Dissenting critics and fans will rush to point out that for once their work isn’t focusing on teenagers and the setting isn’t Japanese, thus it’s much riskier than usual… even though the show itself appears to have a sure path to success as long as they can keep up the terrific execution. Which to be fair is what anime usually struggles with, but they’re a bit of an exception. Series director Taichi Ishidate is a very straightforward person with no intention of hiding his influences. He’s been increasingly mixing the grand spectacle of high profile American movies he loves with the obsession over character expression that defines his studio. The end result here is a series that is shaping up to be like a nice Hollywood film, both in its spectacular production values and the transparent intent to pull your heartstrings – which as far as I can tell is already working! If you’re into anime for more eclectic work, chances are you won’t fall in love with this (although so far it seems very hard to hate, too), but otherwise it seems like a sure international hit. Netflix’s intervention is unfortunate, but I have to acknowledge that this time they’ve targeted something that makes a lot of sense for them to grab. Now if only they had some of that sense when it came to timely releases. But I digress. Since the first two episodes are essentially just the introduction of Violet to her workplace at the CH Postal Service, as well as a quick peek at her past, you shouldn’t worry about narrative spoilers yet. Ishidate, alongside the other performers at the event, constantly stressed that the series will be all about her growth from essentially nothing. Which is to say, there isn’t much we can say quite yet, other than pointing out the believability of her naivete. What we can talk about, however, is the frankly ridiculous animation effort. Properly appraising Ishidate’s fantastic storyboards for the first episode will have to wait until it has received a proper release as there’s tons of imagery I’d like to talk about in depth, but the sheer strength of the production is something I can already get across. 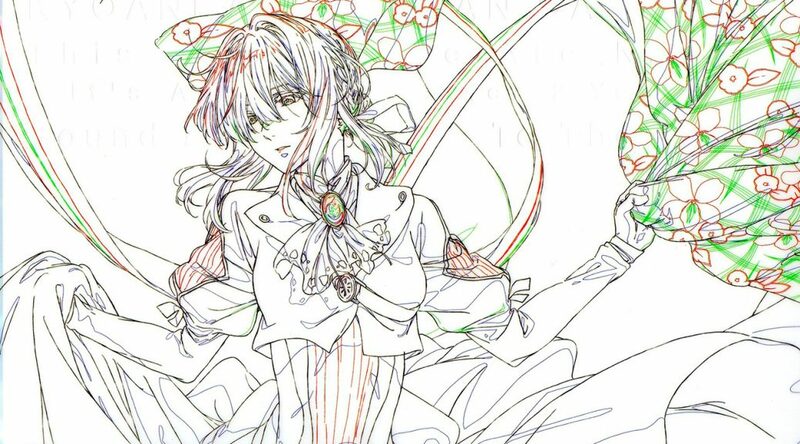 Debuting character designer and chief animation director Akiko Takase has an overwhelming style in all regards. Very intricate designs with obscenely detailed clothing, none of which get spared when it comes to actually animating the show. There are a quantity of lines that makes any cut feel like a massive endeavor, to the point that I don’t think this could have ever existed as a standard project – though thankfully it is anything but normal! Arguably the most impressive feat isn’t reaching this level of detail, but rather how unashamedly it all moves. Even ridiculous sequences with complex camerawork and 2D crowds retain these extraordinary drawings. As usual when it comes to KyoAni’s more serious work, though, the expression is achieved more through obsessive attention to gestures and body language than through the movement itself, although there is some of that; there’s a cut in the first episode with Seiichi Akitake’s animation flair all over it that stands as a great example of amusing expressivity achieved through the way the drawings move rather than the actual actions of the character, even if that isn’t the focus of this show. There’s no quality drop in the second episode, which is hardly a surprise for the studio but might have been expected when the first episode set such a high bar. It doesn’t have quite as many complex sequences, instead managing to present itself as majestic in other ways, like its incredible 2D mechanical art. It feels as if Euphonium has rekindled a certain passion at the studio, because the gorgeous cuts of Violet’s robotic hands and the typewriters they use are more than plentiful. This episode is also a notorious return to production stability, as it was entirely supervised by Chiyoko Ueno and didn’t require many animators; #1 was clearly rushed to meet 6 month early prescreen deadlines and so Takase couldn’t supervise it all (noticeable in some scenes with Hodgins’ hair, as long as you’re very familiar with her style), but #2 is a return to KyoAni’s (ab)normally short staff lists. 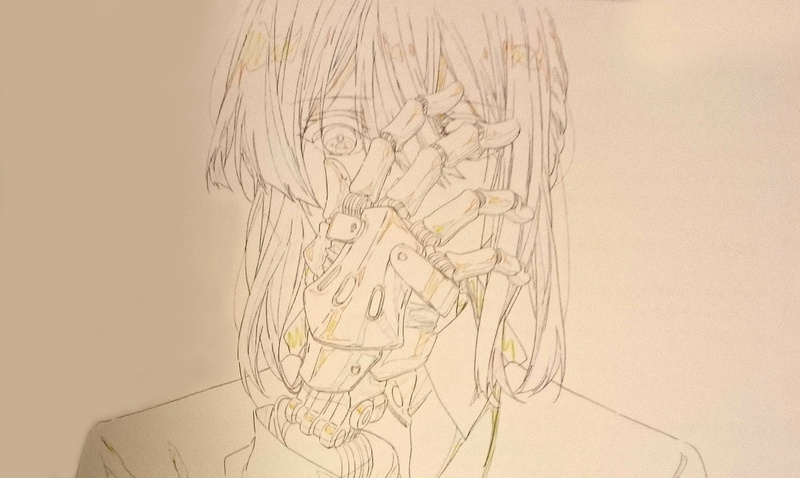 Alongside Nobuaki Maruki, Ueno is one of the few animation directors at the studio who blossom in detail, so her work felt very compatible with Takase’s to begin with. The last scene in particular, with Violet trying out her uniform for the first time, features nothing but jaw-dropping art. It’s also worth noting that this second episode was directed and storyboarded by the studio’s new rising star, Haruka Fujita. Not only that, she’s also been appointed as the show’s series director (シリーズ演出), meaning that she’ll have a lot control over the execution of the show. My first impression was that Ishidate’s storyboarding work was stronger, while Fujita imbued in it more of her style as an episode director. Violet’s delicacy, which is by no means fragile, seems to fit her like a glove, so having a young creator receiving such responsibility isn’t the only reason to rejoice. I have to admit though, I’m very proud to have talked about her alongside Takase in the KyoAni-focused post of our series on brilliant youngsters. As it turns out, they’re now a team! It’s not just the animation department that delivered stunning work, though. There’s a clear intention by the studio as a whole to turn this into their new flagship title, which means that everyone clearly gave it their all for this. Maidragon’s team of Yuka Yoneda as color designer and Mikiko Watanabe as art director returns stronger than ever. I’ve always found the show’s palette attractive, but rather than the vivid colors themselves it’s the thoroughness of the painting that is the most striking; it always feels like highlights and shadows are granted extra tones that they wouldn’t usually have, making every shot feel even richer in detail. And although they don’t have the appealing roughness of the first key visual and her previous work, Watanabe’s background art is a huge improvement over her own take seen in Evergarden’s novel commercials. That vague sense of digital sterility is gone, replaced by much denser traditional work. The European inspired scenery is always a joy to look at. The composite deserves a mention as well, since it will catch the eye of many viewers. This is Kohei Funamoto’s major debut as director of photography after having served as assistant on projects like Hyouka and Tamako Love Story, but ultimately it’s Ishidate’s vision that seems to dominate this aspect. Unlike the camera lens freaks like Naoko Yamada and Tatsuya Ishihara, Ishidate isn’t concerned with emulating effects as if he really were filming his cartoon. Instead, the very noticeable postprocessing effects simply try to give extra oomph to the animation, ideally without getting in its way. Your mileage may vary in this regard, but I found it spectacular despite not being the biggest fan of his approach, so chances are that you’ll be pleased as long as you’re not an extreme purist when it comes to anime’s composite work. I have no issue acknowledging that I was quite skeptical of the extreme praise that Violet Evergarden was getting after its US premiere. KyoAni’s strongest production seemed like an exaggeration that I felt might have been born precisely from those fancy digital effects, since a lot of fans are – rightfully, don’t get me wrong – in love with very shiny cartoons. After having sampled it myself though, I can’t deny that this is at the very least a candidate for that title; Evergarden isn’t just a flashy anime (though it sure is one), it also seems to be fundamentally very well put together, in ways that you should never expect from something that’s technically a TV anime. If it’s won me over despite not really appealing to my sensibilities, you might want to keep an eye on it as well. I’ve been waiting for recordings of the event to pop up but there aren’t any so far. Was the event high on security or something? As far as the series go I’m not really that hyped; doesn’t look like my cup of tea, but I’m interested to see the mechanical animation. Very different culture, lol. If it happened it would have been a foreign fan, and there weren’t that many of them. I’m confused. Who is the series director? Ishidate or Fujita? Ishidate is kantoku, Fujita is series enshutsu. 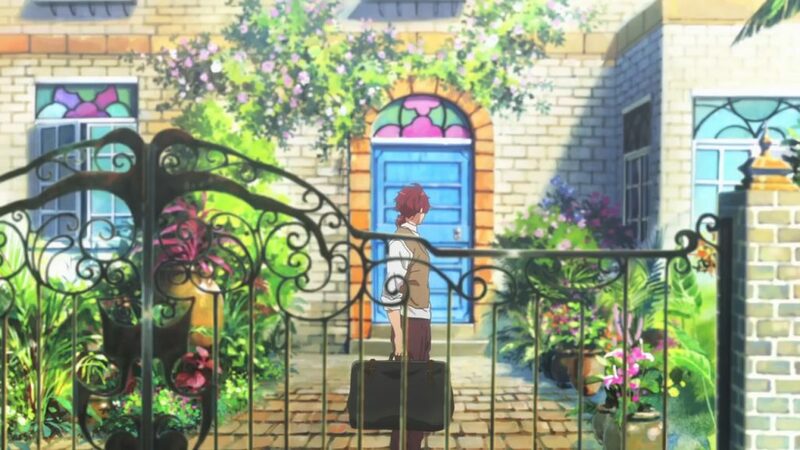 It’s becoming a common system for KyoAni, but the way the work gets split depends on each case. So same as Yamada with Euphonium? Any other Kyoani works with the same structure? Earliest example of series enshutsu was Yamakan in the original Haruhi. But if you include similar situations with technically different titles there’s plenty – Ogawa as Chief Enshutsu on the new Kyoukai film, even cases like Ishidate in Nichijou. The studio is pretty fond of doble director setups. Thankyou for the article. I can’t wait for this amazing show to start airing. The animation honestly looks better than anything I’ve seen in movies let alone TV shows. Not particularly, it was standard JP anime event affair. A bit more classy than TV series ones tend to be but that’s about it.